LOS ANGELES (AP) — Paul Walker, the star of the "Fast & Furious" movie series, died Saturday in a car crash that killed one other person outside of Los Angeles. He was 40. Walker's publicist Ame Van Iden confirmed the actor's death Saturday afternoon. A statement on Walker's Facebook page said he was a passenger in a friend's car, and that Walker was in the area to attend a charity event for his organization Reach Out Worldwide. 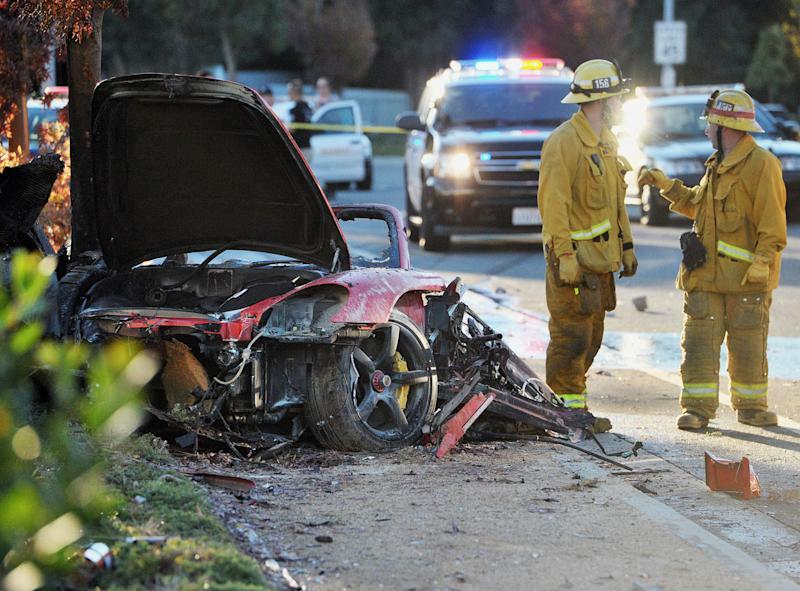 The Los Angeles County Sheriff's Department said that speed was a factor in the crash. Deputies found a Porsche Carrera GT engulfed in flames when they responded to a report of a collision in the community of Valencia, north of Los Angeles. Two people who were found in the car were pronounced dead at the scene. 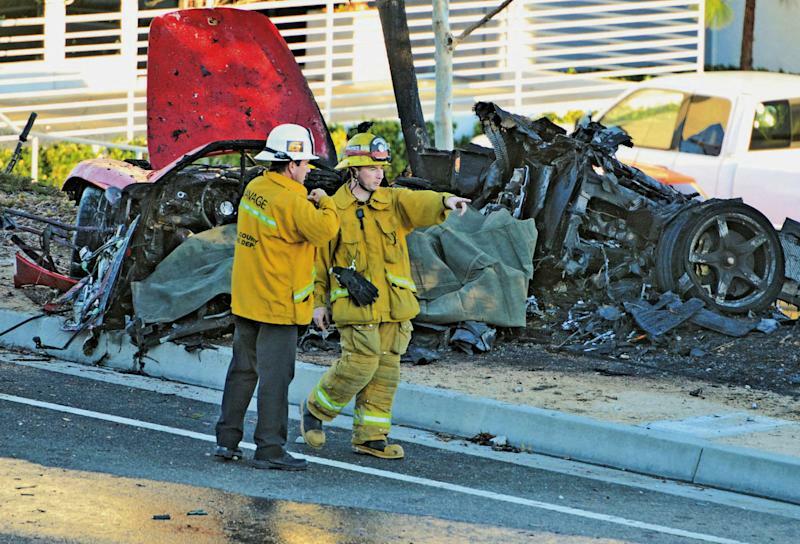 The Santa Clarita Valley Signal reported that the Porsche crashed into a light pole and tree and burst into flames. The fundraiser, to benefit victims of Typhoon Haiyan, took place at a nearby racecar shop. Attendees rushed to put out the flames with fire extinguishers to no avail. "All of us at Universal are heartbroken," Universal Pictures, which has released the "Fast & Furious" franchise, said in a statement. "Paul was truly one of the most beloved and respected members of our studio family for 14 years, and this loss is devastating to us, to everyone involved with the 'Fast and Furious' films, and to countless fans." His "Fast & Furious" co-star Vin Diesel posted a photograph of him and Walker arm-in-arm on Instagram with the message: "Brother I will miss you very much. I am absolutely speechless." Walker rode the "Fast & Furious" franchise to stardom, starring in all but one of the six action blockbusters, beginning with the first film in 2001. The blond-haired, blue-eyed Los Angeles-native brought California surfer good-looks and an easy, warm charm to the popular street-racing series. The son of a fashion model and a sewer contractor, Walker grew up in a working class, Mormon household in Glendale, Calif. The oldest of five siblings, Walker's mother began taking him to auditions as a toddler. He was a child model beginning at the age of 2. Walker has said the early induction to show business wasn't to start him on a career path, but as a way to help provide for the family. After a string of TV roles as a child in the '80s, including small roles on "Who's the Boss" and "Charles in Charge," Walker made his feature film debut in the 1998 comedy "Meet the Deedles." Supporting roles in the films "Pleasantville," ''Varsity Blues" and "Flags of Our Fathers" followed. His performance in the 2000 thriller "The Skulls" caught the eye of producer Neal H. Moritz, who cast him in "The Fast and the Furious" as undercover police officer Brian O'Conner. Adapted from a Vibe magazine article about underground street races, the film became an unexpected hit. In the sequel, "2 Fast 2 Furious," Walker moved to center stage with Diesel temporarily dropping out. Walker, a self-described "gearhead," kept his character's sports car from the film. Walker starred in other films, including the crime thriller "Running Scared," the Antarctic adventure "Eight Below" and the heist film "Takers." 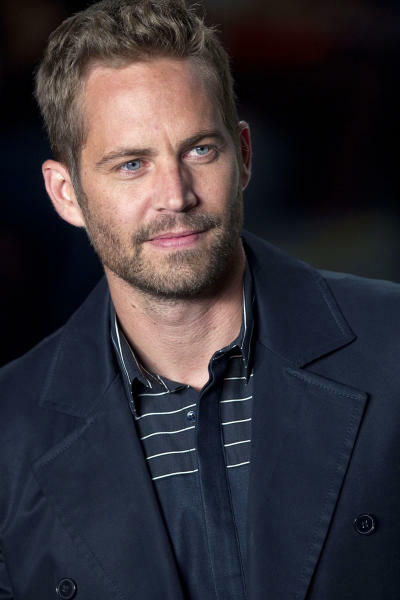 Though his stardom didn't make as much of an impact outside the "Fast & Furious" series, Walker continually drew praise from his co-stars and directors as a kind-hearted and eager collaborator. "Your humble spirit was felt from the start," Ludacris, Walker's "Fast & Furious" co-star, said on Twitter. "Wherever you blessed your presence you always left a mark, we were like brothers." "Fast & Furious" proved unusually enduring. Released in May, "Fast & Furious 6" was the most lucrative of them all, grossing more than $788 million worldwide. The seventh installment began shooting in September, with a release planned for July. The film's production was on break with more shooting to be done. Walker stars in the upcoming Hurricane Katrina drama "Hours," which Lionsgate's Pantelion Films is to release Dec. 13. He also stars in "Brick Mansions," a remake of the French action film "District B13" in post-production that Relativity plans to release next year. "Paul was an incredibly talent artist, devoted philanthropist and friend," Relativity President Tucker Tooley said in a statement. He formed Reach Out Worldwide in 2010 to aid people struck by natural disasters. A friend of Walker's who attended the fundraiser Saturday, Bill Townsend, told AP Radio, "He was very happy. He was smiling at everybody, just tickled that all these people came out to support this charity. He was doing what he loved. He was surrounded by friends, surrounded by cars."